Monday morning was a bit of a rush. I was chairing a meeting at 10.00 and there were a whole load of little jobs I wanted to get down before I left. So I grabbed my Uncalendar and began my to do list. Then I stopped. The first written word of the day. I have a perfectly good phone I could write my list on there. This is hurting. I HATE using electronic planners and diaries. 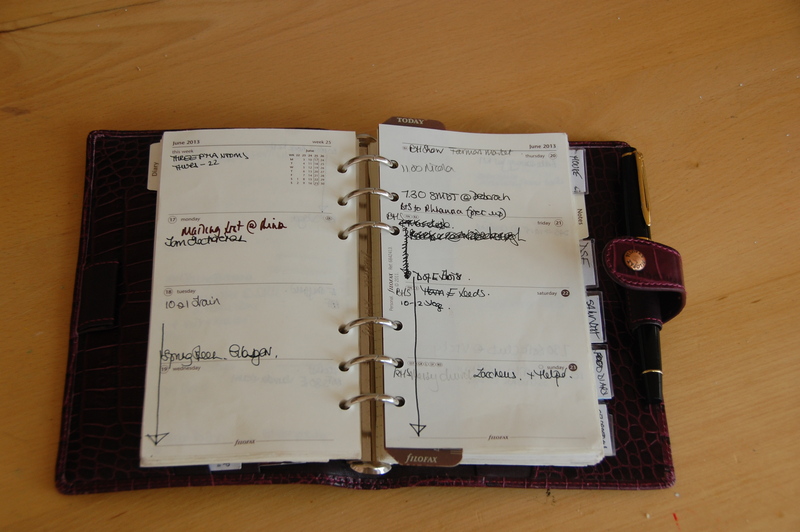 I am totally wedded to the system I have set up for myself using a Filofax and Uncalendar. I am an organisational freak, I could write an entire blog about how to organise your life, your cupboards. I am the little girl who catalogued all her books and thought organising her knicker drawer was a good way to while away an afternoon. I cannot go digital. I knew this would hurt. But I didn’t realise how much. Still, this week is about noticing where and how I used the written word, printed or handwritten and looking at how I can change my habits. It is not about cutting them all out on day one. Which is a great relief. I could change to digital insofar as digital diaries and planners exist. But first of all they have to be charged on a regular basis, secondly you have to turn it on, scroll to the right page, bring up the keyboard, type it in and save. 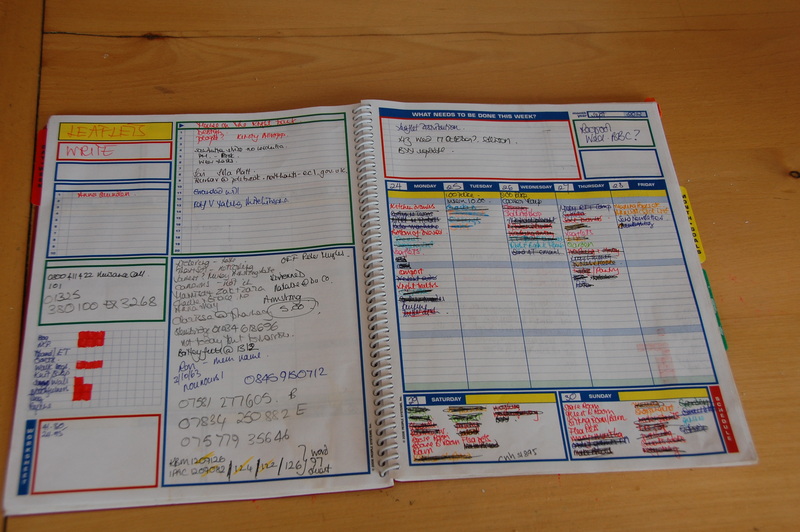 Compare that to filofax. Open, remove pen from pen loop, write, close. Also I am a very visual person. I could never use a digital clock because I can’t see the space between the time now and the time I have to be at a meeting for example. Instead I have to work out that there are 50 minutes between now 13.30 and the meeting 14.20. Consequently when I open my filofax I can see my week. I understand what the arrows mean across various days. I can see the space in my day. It gets a bit more complicated when I move into the Uncalendar, but I cannot imagine turning that into something manageable digitally and still being able to give me an instant picture. At the meeting there was an agenda and the minutes of the previous meeting. Both of these are on my laptop so no problem there. I was unexpectedly minute taker as well and I did that by hand. I could easily have done that on the laptop so a lesson learned there. One of the charities we are supporting came to give us a presentation. It was excellent – he gave out business cards at the end. I took one. Why? I have his email address, I have his website address with all his contact details. I didn’t need to take a bit of cardboard. Lesson Two. On the way home I dropped off a carpet stretcher we had hired to replace the flooded carpet in Singer Two’s bedroom. On hiring it I was given a receipt. On returning it I was given another one. Why did there need to be two? I sent a parcel to Ireland and was given a receipt. I didn’t ask for proof of posting. It is only mid afternoon and I have already accumulated 4 pieces of unwanted words and paper. I haven’t even looked at the post yet.